In its normal form, the structure of the human foot allows us to walk in an upright position. Our feet consist of bones, joints, muscles, tendons and ligaments, which also keep everything in place. This makes them stable and strong, while at the same time being flexible and adaptable. Feet can become deformed as a result of external factors, certain foot postures or diseases. Foot deformities may – but don’t always – cause problems, such as pain and walking difficulties. There are various types of foot deformities. Some are present at birth. Most people have slightly deformed feet. This is completely normal and usually doesn’t lead to any problems. Hardly anyone has “ideal” feet. 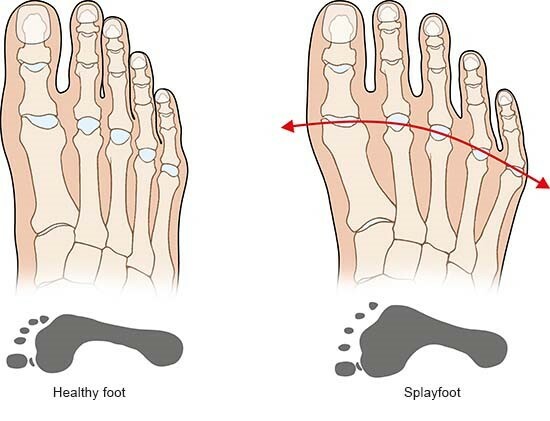 In splayfoot, the metatarsal bones spread out and the front end of the foot becomes wider. 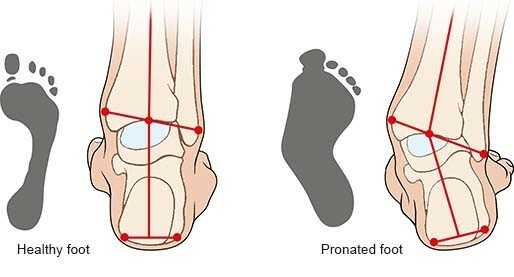 As a result, more pressure is put on the middle bones in the forefoot. This is usually painful, and can make the skin hard and thick, leading to calluses. People with splayfeet are also more likely to develop bunions (hallux valgus). This is where the first metatarsal bone moves sideways (towards the other foot) and the big toe leans in towards the neighboring toes. In people with fallen arches, the hollow arch under the foot is flatter than usual. When standing and walking, most of the foot – from the heel to the ball of the foot – touches the floor. Fallen arches can become painful after a number of years, particularly when you put your weight on them. More extreme cases of fallen arches are referred to as flat feet. This is where the entire sole of the foot touches the floor. 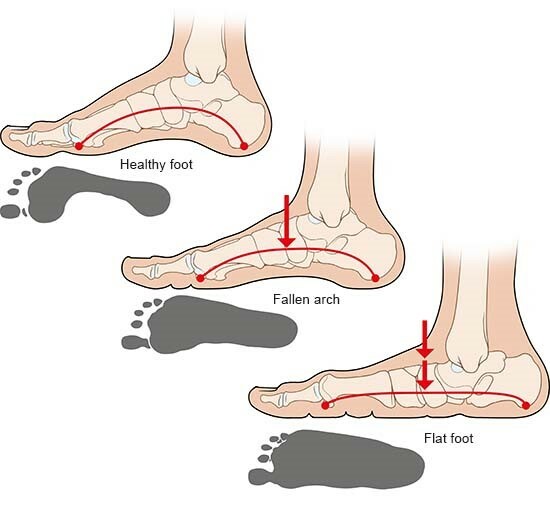 Fallen arches and flat feet usually develop over time. People are rarely born with them. The possible causes of fallen arches include weak foot muscles, abnormal strain on the foot, unsuitable footwear and joint inflammations. In this foot deformity, the heel leans inward. Pronated feet already arise in childhood, often together with a fallen arch or flat foot. But they usually only start causing problems after several decades – at around the age of 30 or 40. In people who are overweight and/or knock-kneed, the foot often remains pronated. Many parents look for medical advice because they think that their child might have a flat or pronated foot. It’s normal for the soles of children’s feet to be flatter than those of adults, though. The foot arch, midfoot and hindfoot only reach their actual normal position at around the age of ten. So “flat feet” usually don't need to be treated in children. As the name suggests, people with this foot deformity have an unusually high foot arch, and the upper surface of the foot (the instep) is higher than normal too. Because of this, the ball of the foot has to carry more of the weight. This can lead to pain and calluses (areas of hard, thick skin). High-arched feet are often caused by nerve problems. They increase the likelihood of ankle injuries and claw toes. In equinus foot, the foot points down and the heel can't be lowered onto the floor because the calf muscles are too short. People who have this deformity can only walk and stand on the front and middle part of the foot, and they can't roll the foot in a smooth heel-to-toe movement. Equinus foot may arise following brain damage that affects the communication between nerves and muscles. It can also develop in people who are bedridden for a long period of time, or who have had an injury (e.g. an ankle injury). In this severe deformity, the foot points down and inwards. It’s often only possible to stand on the outer edge of the foot, or – in extreme cases – even only on the upper surface of the foot. The person has difficulties standing and walking, their foot hurts and eventually stiffens. People who have a clubfoot are usually born with it. In those children, certain muscles don’t develop properly during pregnancy. The reason for this is often not known. Genes and developmental problems in the mother’s womb are thought to play a role. Clubfoot is more common in boys. It can occur together with a developmental problem affecting the hip (hip dysplasia). Foot deformities or misalignments (wrong positions of bones) can either be present at birth or develop over time. Putting abnormal strain on the foot or wearing tight shoes may play a role. Further risk factors include injuries, inflammations and being overweight, as well as diseases such as osteoarthritis, rheumatoid arthritis, or brain diseases. Genes usually play an important role: For instance, some people have weak connective tissue, so the supporting structures in the foot can’t always hold everything in place properly. Sometimes children’s feet may appear to be deformed, but are in fact normal. This is because young people’s joints and bones are still developing and changing. What are the consequences of deformities? Deformities can be painful and affect the way you walk. They may cause a lot of skin to become hard and thick, and lead to calluses and pressure sores. 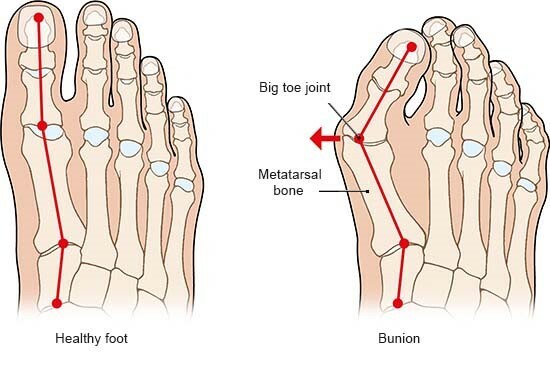 Sometimes misalignments (wrong bone positions) can cause toes and other parts of the foot to become deformed too. This puts abnormal strain on tendons and muscles, which may even tear as a result. Abnormal strain on joints can lead to wear-and-tear, and eventually to osteoarthritis. Because foot deformities can have a knock-on effect on other parts of the body, they may also cause pain in the knees, hips, back and head. But they don’t always cause problems. Many people have slightly deformed feet or minor misalignments that don’t cause any symptoms. And, contrary to popular belief, deformities that are more visible don’t always cause more problems. Slightly deformed feet may cause more problems than more noticeably deformed feet. Sometimes people are thought to have a foot deformity although they actually don’t have one. For example, children often have a slightly pronated foot with a fallen arch. But this usually doesn’t cause any problems, and often goes away when they are teenagers. Deutsche Gesellschaft für Orthopädie und Orthopädische Chirurgie (DGOOC). Hallux valgus. AWMF-Registernr. : 033-018. April 2014. Deutsche Gesellschaft für Orthopädie und Orthopädische Chirurgie (DGOOC). S2k-Leitlinie "Kindlicher Knick-Senk-Fuß". AWMF-Registernr. : 033-020. January 2017.